About a year ago, one Thursday evening, I ventured out of my home-bound knitting realm and joined a group of people I didn't know in public to knit. It was the first of many, many Thursday nights spent out of my house ingesting wool fumes with other like-minded fiberholics, and is the greatest thing since sliced bread. I am typically prone to inertia (not to mention being somewhat introverted), and leaving my house after dark doesn't happen often unless IM and I are headed out on a hot date. But all that changed last spring, and now I chomp at the bit every Thursday until I can get out the door. This week I've been working on the last of my handspun giftees for The Ladies (most of whom are grouped over there under a ridiculous jumble of letters). In almost two years of spinning, I've done lots of pure fibers - Romney, merino, BFL, Corriedale - but not so many blends, and certainly never one with three different fibers in it. 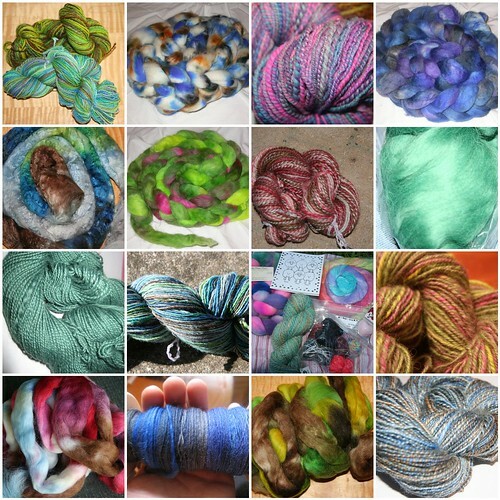 Fiber: alpaca/merino/silk (65%/20%/15%) from Little Barn. 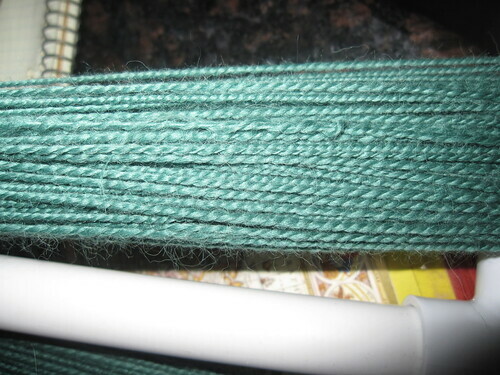 Spun/plied: 9.25:1 (I finally checked the actual ratios on my wheel). 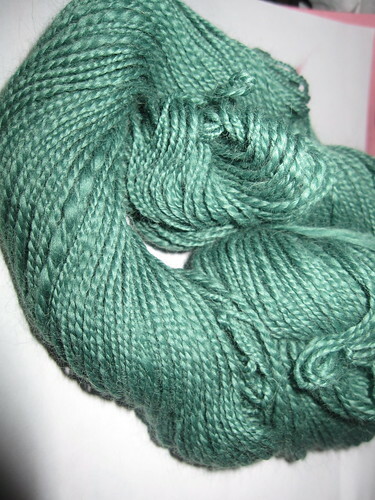 I found this vendor by searching for CVM roving (California Variegated Mutant), and ended up leaving their site with 24 oz of fiber; the CVM, a tweedy wool blend, and this gorgeous green stuff. It was described on the website as a turquoise color, but it is really really green. Kelly green, leprachaun green, bright green. Not exactly a green that I do a lot of, but still gorgeous stuff. I spun up the singles really quickly - I managed 2 oz in one night even! 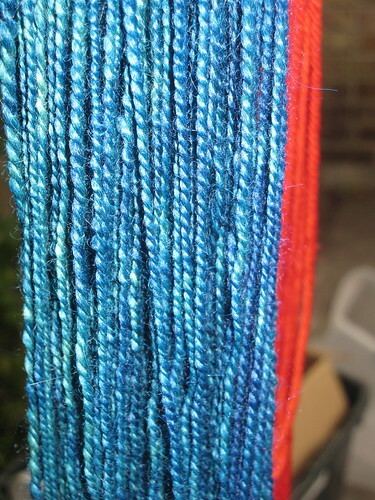 - and then plied together with a fair amount of twist. This is intended for someone who likes more of the blue colors, and since I'm in such a frenzy to use up some of my dyes, I tried overdying this with some blue to get more of a teal color. It's lovely soft stuff, and I hope there's enough here for a lacy scarf or something like that. I'll update with final specs once it's dry. And just to whet your appetites ladies, here's a mosaic (with original fiber and final yarn): any predictions on who's getting what? Written by porpoise On April 4, 2009 In "PS Cardinal Directions", "PS North", "spinning"